Lately, I've been stuck in a fashion rut. It's cold and wet practically everyday. I'd much rather stay indoors in my warm and cosy flat listening to Christmas songs on repeat and lighting scented candles while entertaining friends who drop by for a coffee or a meal. On the fashion front, I'm too lazy to think of new ways to dress myself. My daily outfit consist of one of my many V neck merino jumpers from Uniqlo which I stock up when they're discounted to £14.99 including shipping paired with my new James Jeans Twiggy skinnies and my indispensable Hermes shawls. I love that my friends have no idea that they're designer shawls. They just think that designs and colors are awesome. I'm sure most of them would collapse in shock and horror if they ever found out that these Hermes shawls cost £730 a pop. The way I see it, these shawls get worn 8 months of the year and have an amazing resale value. The problem with running an online consignment store is that you see everything in resale value terms. I calculate that after 3.5 years, my Hermes Tohu Bohu shawl (burgundy) cost barely 80 pence per wear (calculation based on previous price of £675 worn for 8 months per year). In case you're wondering, yes, I'm trying to justify my rather expensive Hermes shawl addiction. Outfit: Uniqlo V neck jumper, James Jeans Twiggy skinny jeans, Comptoir des Cotonniers cardigan, Hermes boots and Hermes Ex Libris cashmere shawl. Outfit: Uniqlo V neck jumper, James Jeans Twiggy skinny jeans, Uniqlo cardigan, MNG leather jacket, Hermes boots and Hermes Ex Libris cashmere shawl. They are beauties, I've given up too, I just can't be bothered making an effort I just want to be warm. I've burrowed into my parka - it'll be months before I leave it. I love these shawls! I ony have one myself but yours are wonderful and go with so many outfits! BTW, do you use special light while taking pictures? These pictures look so great. I love the Hermes shawls, they are so beautiful! I was just wondering if the cashmere shawls are really able to keep one warm? I love the outfits you put together- especially the first and third ones!! All the outfits look fabulous and the shawls are to die for!! Tabitha, I hear you. Right now, I just want to be warm and dry. Fashion will need to take a back seat. I-Ping, I only have 3 Hermes shawls but they do go with everything. Ever since I started buying the shawls, I hardly wear silk scarves. QY, the funny thing is I've often admired the amazing photos that you took! I don't get a lot of sun so I just shoot before 1pm. I then process them via Photoshop to brighten the background by adjusting the curve. Let me know if you want to see screenprint of what I do. Cecelia, these shawls are super warm because of the tight weave. They're excellent blankets particularly on long flights too. It gets really cold here so these come in very handy. Skippysays, so sweet of you to say so. These are what I call fashion rut outfits. Anne, thank you! I'm ashamed to say that I just pile different jackets on the same ensemble (jumper, skinny jeans and boots). These are just beautiful! I love everything about the outfits - the pops of color, the perfectly worn in riding boots without any cumbersome frills, the base palette of navys grays and blacks, etc, etc. With outfits like yours M. you don't need to think about any other options! Impeccable!!! You need to style others. Your wardrobe is awesome. I drool every time you post what's in your closet. Anyone that sports an olive leather jacket is a bad son of a gun! FIERCE! That tells me a lot right there. I would gladly wear any of these 3 outfits. 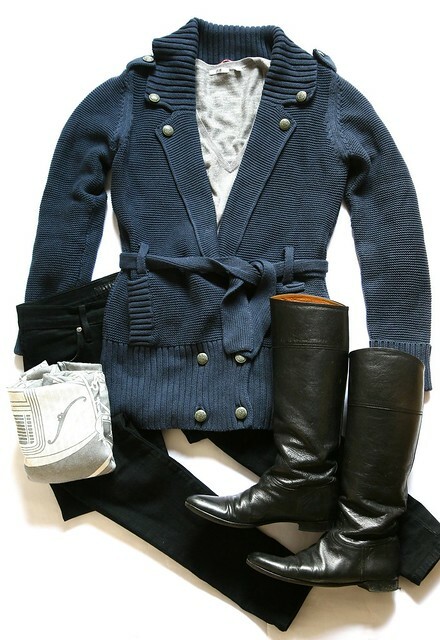 The uniqlo cardigan in the first outfit is gorgeous, it has a military edge to it! I really, really want a cashmere shawl as well from H - I've been sniffing around the resale market too for a good one :) I wish they'd bring back that Cheval design! Maybe you can send it to info@q9y8.com when you have time, thank you and hugs. Mandi, just to be cruel, pop by and try on my shawls. BTW, you can get VAT back to and they cost far less than Balmain. Lindsay, so kind of you to say that. It's a case of keeping it really simple because I'm too cold to think of trying to look chic. **hugs** I'm very touched by what you'd said. Thank you again. Kim, LOLOLOL! I like that the little ol midget me can look like a bad son of a gun. I don't know if I can style others but what a nice thing to say! Bessie, oh that's actually from Comptoir des Cotonniers. It's my favorite French High st store that I tend to shop at. Kat, I've worn all my 3 shawls to death. The problem with Hermes shawls is once you get one, you're sucked into this new addiction. I can't believe I don't have one of these yet! Fabulous as usual!! Laura, seeing that you've got the same skintone as me, I think you'll really like ex libris. Just found your blog , and it's weird ...I'm uniglo V necks, uniglo or Paige skinny jeans ,boots and Hermes GM shawls. I now have 2 and wear them constantly . It's a big spend and frankly not one to be cashed in any time soon , but I only buy skinny jeans, cashmeres and coats [Uniglo] and a leather jacket . I find most clothes boring , although I have a major boots and Hermes addiction . Love the Isabel Marants ! So wearable, comfy, but still very very chic! I love the cardigan from the first outfit! The military detail make the outfit a little more edgy. <3 And Your Hermes boots are TDF. i don't mind paying more if i get lots of use. as you said, it is cost per wear that is important. Estrella, goodness, your outfit sounds like mine! I don't deviate all that much from the list you've mentioned either. I'm not much of a clotheshorse and prefer to shop from a small selected brands that I"m loyal too. As for Hermes addiction, I tell myself it's cheaper than cars :) Believe it or not, these ankle boots are custom made by another company that specializes in small shoes. I'm hoping that Isabel Marant starts making shoes in smaller sizes. Mia, thank you! So sweet of you to say so. You're right. I'm all for comfort. Savvy Gal, you're absolutely right. I think I've wasted enough money of tons of cheap brands which I inevitably get sick of or they fell apart after a few wears. I would love, love, love an Hermes scarf or shawl. The outfits you put together are fabulous... I can definitely see how you get your money's worth out of these pieces!